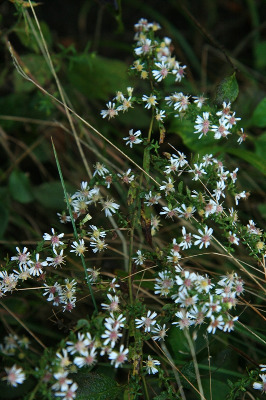 Aster lateriflorus of Michigan Flora. Usually in ± shaded ground, including forests (beech-maple, oak-hickory, mixed hardwood and conifers), thickets, borders and clearings, swamps (conifers or hardwoods); floodplains, river banks, ravines, rocky banks and openings; also meadows, shores, roadsides, rarely peatlands. Ordinarily well distinguished by the deeply lobed disk corollas, which all turn rosy early in anthesis (unlike most asters, before starting to wither); leaves with only the midrib hairy beneath; ± one-sided racemose branches of the inflorescence; and stems arising from a short perennial base rather than being colonial from an elongate rhizome. The rather slender stems vary from glabrous to pubescent and are often branched or sprawling from the lower nodes. Leaves vary from linear and entire to elliptic and toothed. Pedicel length varies. Names have been published for some of these intergrading variants. The basal leaves, when present, have relatively broad elliptic or rotund blades. The contrasting white rays, still fresh when the disks are rosy purple, are presumably the source of the common name. MICHIGAN FLORA ONLINE. A. A. Reznicek, E. G. Voss, & B. S. Walters. February 2011. University of Michigan. Web. 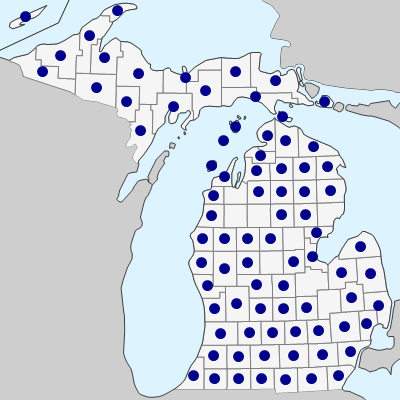 April 19, 2019. https://michiganflora.net/species.aspx?id=486.